Clearly there are speed increases moving from an older i5 processor to the latest Kaby Lake i7 and moving from 8GB to 16GB RAM (and I have to assume that the new 512GB SSD is faster than the old 256GB SSD) and then there’s the eye popping display. Wow. Benchmarks may be meaningful to some (and I noted that some of the technical reviewers included them) but for me, real world use with the apps and programs *I* use are what is important. I’m not a gamer (and I’ve heard that gaming is much better on the newer Surface than every before). I’m an advanced user/creative (photography) and I care about things like Lightroom, Capture One, Photoshop, etc. The new Surface Pro also has a neat feature for creatives: a dual color space where you can select sRGB or Enhanced. So why is sRGB/Enhanced important? If you are a photographer producing for print using a commercial print house, you want as accurate a color space as possible, and sRGB is the way to go. Enhanced is great for watching movies, videos, and just general computing; colors pop and seem vibrant, almost three dimensional. It’s pretty difficult to show the differences in the two color spaces on the web, but I decided that showing thumbnails side by side of sRGB vs Enhanced might illustrate the difference. 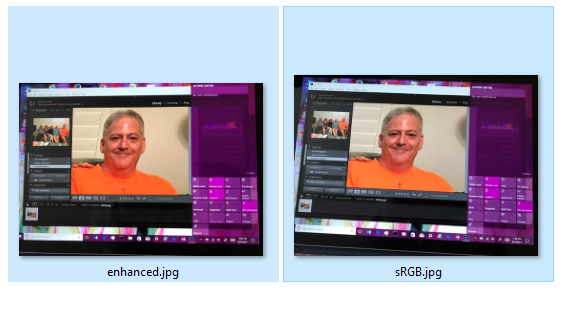 Using Lightroom 6, I switched color spaces and took a screen shot the two thumbnail images below in File Explorer (making no changes in Lightroom). I’m not sure how this will appear on the web in various browsers/platforms, etc., but hope that the difference is discernible. With the “hot” color the subject is wearing, the sRGB would make a better print (in my opinion). I’ve found the new Surface Pen to be more responsive (seemingly no lag at all) on my new Surface. I have an older version of Photoshop (CS5) which does not have native Surface Pen support. Microsoft didn’t post the needed Wintab drivers on the specific download page for the new Surface Pro, but I downloaded and installed the 64 bit version (Wintab_x64_1.0.0.20.zip) from the SP4 download site and this works just fine. 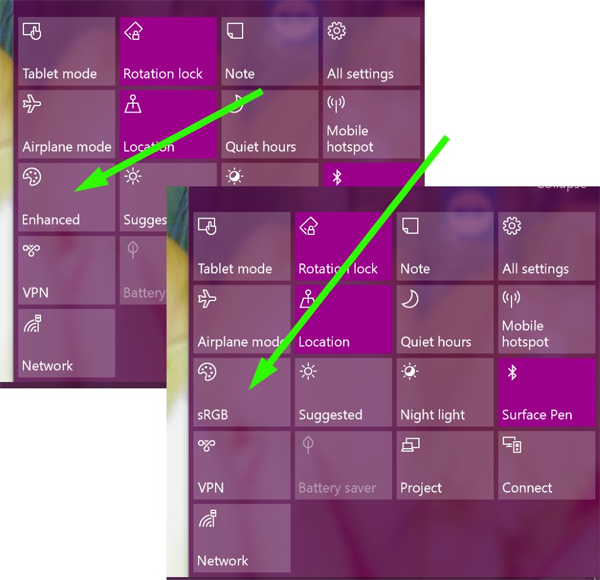 I’ve asked an internal contact about why this is missing from the new Surface Pro downloads. 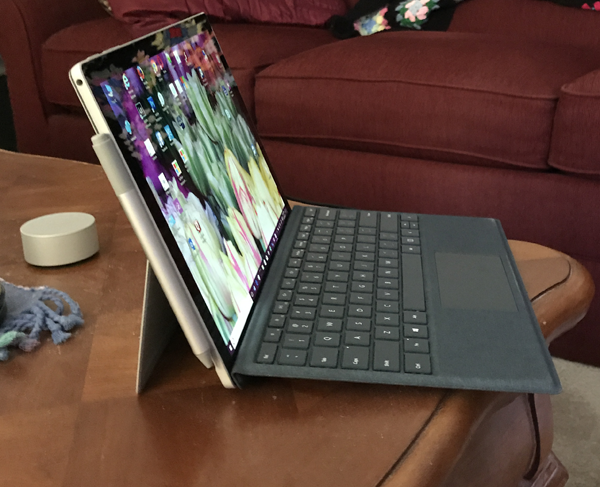 Some reviewers have been complaining that the new Surface Pro isn’t bleeding edge and lacks things like USB-C, etc. and that it is only incremental. In my mind, incremental is good. Reminds me of the years that I bought ThinkPad’s where there really weren’t any huge leaps in technology, but there was stability. I’m fine without USB-C. The USB 3.0 port and an external card reader allow me to import images from my camera’s SDXC card and I’m ok with the need for an external card reader. I’m not sure that the new 2017 Surface Pro is a meaningful upgrade for Surface Pro 4 owners, but if you have a SP3 or earlier, and you have the money, in my opinion, it’s definitely an upgrade to consider. I’m very happy with my purchase.